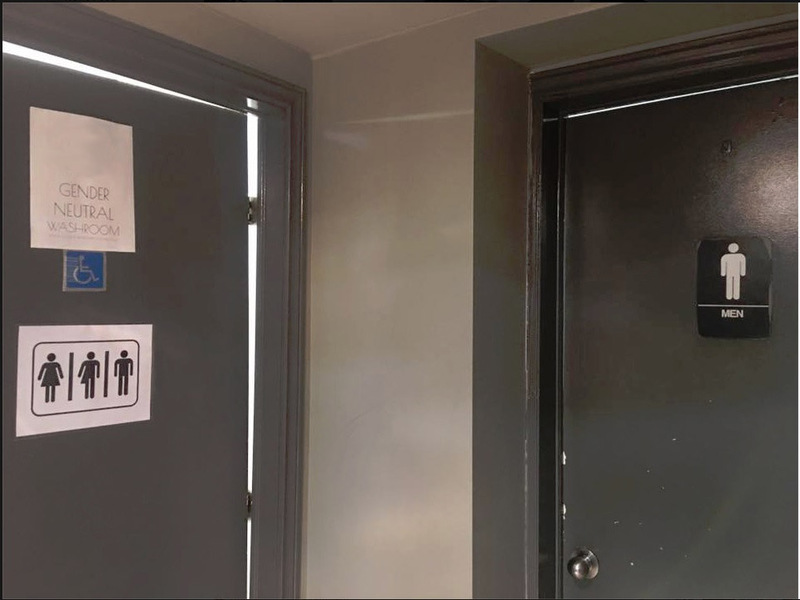 The women’s washroom has been turned into a gender neutral washroom, and a sign on the door indicates women, men and in-between. The men’s washroom remains unchanged. Note: these are not single stall washrooms, they are group washrooms. It’s starting to become a noticeable pattern that when one washroom is made into a gender neutral one, it’s the women’s that gets converted. This means that men can go anywhere but women cannot have any space just for ourselves. If you enter an establishment and find the women’s washroom taken away, please complain to the manager and stop using the business until they provide a washroom for women. Any male allies out there? You can do the same thing. Complain to management that there should be a women’s washroom and do not give them your business until they give it back. Women, please document this whenever it happens. Take a photo and put it on social media. We need to keep records of our spaces being taken away. Transgender activism works to remove women’s right to safety and privacy and does not allow us to set boundaries. We need to oppose it with full force. This entry was posted in Gender, Women & Radical Feminism and tagged Purple Sage, Transgender & Transphobia. Bookmark the permalink. Seriously, transgender activism is not trying to remove a women’s right to a safe space. All trans activists are trying to do is assure they also have a safe space to use the restroom. No trans woman is coming into the women’s room to do anything but use the restroom. Maybe insist to the manager’s that both washrooms become neutral?